“Mikki, can you lend me 50c till we get our pocket money?” (No). But like most siblings, as we moved into adulthood and our relationship changed, saying no got much more difficult. Up until now it’s not really been an issue – pretty much, if we are able to help each other out then we will do it – but, in reality, the situations have been few and far between as to how often we’ve had to ask. For the most part, one of us will offer if we see we can lend a hand. It’s only really been in the last few weeks where I’ve really had to exercise my right to say ‘no’ to her. And, god, it’s hard. As those of you who follow my Facebook will know, Laurie is almost four weeks into a new, healthy approach to food and health. This all came from an unexpected meeting I had with her in Cromwell after the Ancestral Health Society of New Zealand meeting. Truth be told, I got a bit of a fright. High cholesterol, high blood pressure and heart issues run in our family. We had a grandparent that died young of heart problems and a second-degree relative also suffered from a heart attack at around 38 years old. At around the same age, Laurie looked to be the spitting image of her. Even though I’d seen Laurie in January and we talked most weeks on the phone, the picture I have attached to her number is one that is perhaps five years old – so the Laurie I spoke to was (in my mind) younger and fitter than the Laurie that was dealing day-to-day with the health issues that would have been obvious to me had I seen her. So when I approached her about doing something about her health, I did it in a manipulative way that only siblings can get away with: I took advantage of the fact that Laurie isn’t good at saying ‘no’ to me and made it about me and not her. Previously when I had raised it with her (ONLY after an offhand comment about how tired she might have been feeling, or how she wasn’t feeling very good about herself – never unsolicited*), she got angry at me. She was tired, stressed out and got annoyed (to put it mildly) that I would even talk to her about giving up foods that were staples in her diet. How could I possibly understand? She had to organise her household in the morning, go to work in a job which is largely unsatisfying but pays the bills from 9am-3pm, then rush to pick the kids up after school to drop them to soccer or Karate to then pick them up, feed them, do their homework and make sure they were in bed early enough so they could get up and do it all again the next day. She has neither the time nor the money to invest in herself and her health. Telling someone that their future health is at risk if they don’t do something now is often not enough to make a change. Trying to convince them that doing these things will actually make them feel better now is hard to believe when the very idea of trying to change ingrained habits is exhausting. I had to take a different approach – therefore I told her I needed a case study for my business and she was the best person for the job. It doesn’t take a genius to see right through that, and Laurie did in a heartbeat. Truth be told, she had wanted to do something for a while but didn’t have the energy to do it. Now I was taking the role of the bossy twin (easy) and made it about me, It seemed at the time that I took the responsibility away from her and placed it firmly on my shoulders. Which is great, I can handle that – most of the time. Where I struggle though is having to say ‘no’ to her. Right now we are working together to help Laurie make the best decisions possible – and obviously some things that are just common sense to me are completely new to her. She made these awesome scotch eggs from the Well Fed cookbook, and sent a picture to show me how they turned out. They did look great, but I then saw the sweet chilli sauce that occupied a good part of the plate (we Kiwi’s love our condiments). How had I overlooked telling her about the sauce?? We had talked in depth about looking at ingredient lists and going for as minimally processed as possible – and one of the highest sugar products that is in anyone’s refrigerator had made its way to her plate. No big deal, right? Of course not – but I notice I’m far more delicate with her than I am with anyone about putting her right. This week has been especially challenging. Laus text to tell me she was going around to a friend’s house for a BBQ where she was likely to have a few drinks and my heart rate immediately picked up about 60 bpm. She drinks once in a blue moon, and her friend had a bottle of vodka that she wanted her to share. Laurie enjoys her vodka with orange juice, so when we talked on the phone she was tired from a long day and didn’t want to hear me tell her that she maybe she could try instead have her vodka with soda water and a low calorie lime juice. ** As sisters get, we were so annoyed at each other but I knew I had to try and stay calm and not bite when she was telling me I was ruining the one fun thing she had planned. I just told her (in a really calm voice) that I wasn’t trying to ruin anything and she had to make the best decision for her. Then I made an excuse to get off the phone so I could fume by myself. I said earlier that I took the responsibility away from her and placed it on me. That’s not true, and that small exchange made me reflect on that this week. Like all of my clients, it is up to me to provide the best tools possible for her to make changes, and up to her to decide whether to use them or not. I find it so, so difficult. 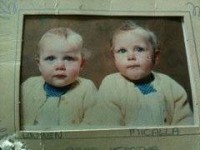 I said before that I took the role of the ‘bossy’ twin. Actually – that’s the only role I’ve had in our relationship. Being bossy only gets me so far now we’re adults though. I am so scared that a harsh word from me, or when I say ‘no’ to her request to have a coffee after dinner, is going to make her fed up enough that she’ll throw in the towel and the hard work she’s done to date will be lost. Some might think that I need to lighten up and these small things don’t matter in ‘the big scheme of things’ as – I say this often – ‘it’s what she does typically that counts.’ Because it’s Laurie I feel (rightly or wrongly) that those rules don’t apply. It’s just the way it is. So, I’m having to say ‘no’ to her more often than normal and I’m not feeling overly good about it. It’s fair to say that neither is she. **yes, of course there are many reasons why Laurie could absolutely be fine having vodka and orange. But I’m not a fan of the alcohol and sugar mix and her reason for liking that drink was that ‘she couldn’t taste the vodka’. I’d rather she drink a drink where she was all to aware of the alcohol in it. Laurie and I. Me: bigger and bossier. 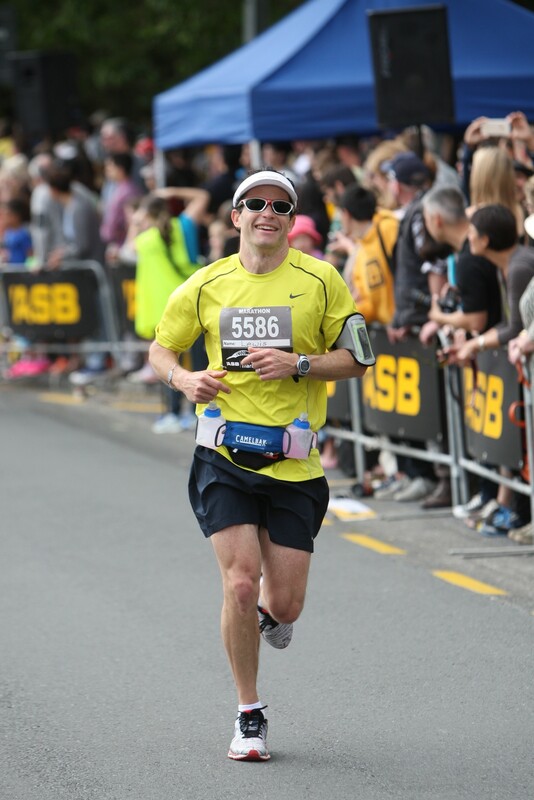 I did my very first marathon (Auckland marathon) two weeks ago. As a reminder, I have type 1 diabetes, eating strictly LCHF for over a year. 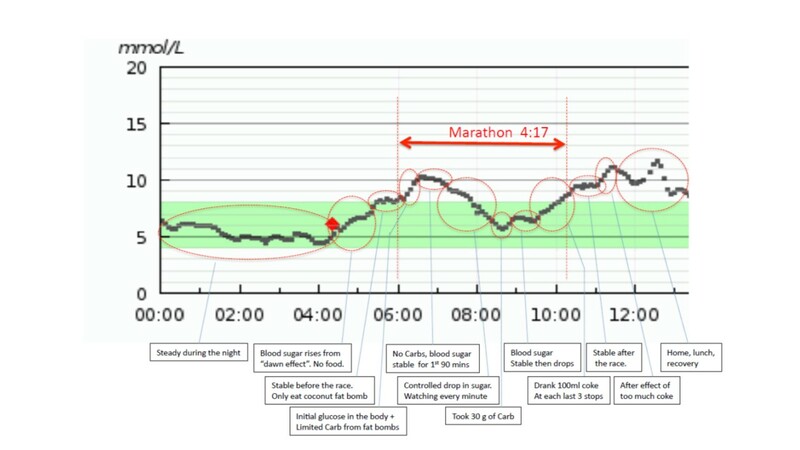 This is not a race report of the marathon, so much, but rather a detailed analysis of my blood sugar levels from before the gun went off to when I crossed the finish line. I wear a Dexcom G4 Continual Glucose Monitor. I inject the sensor and carry a receiver with me. It gives me minute-by-minute live blood sugar readings, which I have downloaded for you. As a diabetic, my body is unable to regulate my sugar levels. If my sugar level is good, then the session is good. The marathon itself, as my first, surprised me by how hard it was. Everyone says 30km gets tough but you have to really experience it to believe it. I could not believe how incredibly tough it was to keep going in the last 10km. My body was fine, but my brain was mush. I was trying to finish at 4hrs, and was on that pace until 30km, but then ended at 4:17. Definitely room to improve for next year. More physical training and certainly more mental toughness will help me last to the final 200 metres. My sugar levels and my energy levels were excellent. Interestingly, I tested my blood ketones (to test how “deep” in ketosis I am) before and after the race too, just to see what was going on. At the start, 05:30, my blood ketones were 0.5 mmol/L. This is pretty average for me. I really battle to get higher levels of ketones than that. After the race (11:00), my ketones were 1.5 mmol/l. This illustrated to me that my body is able to access fat burning when it needs it. I have graphed it and the link below gives a good visual – however I’ve also provided it in detail below. 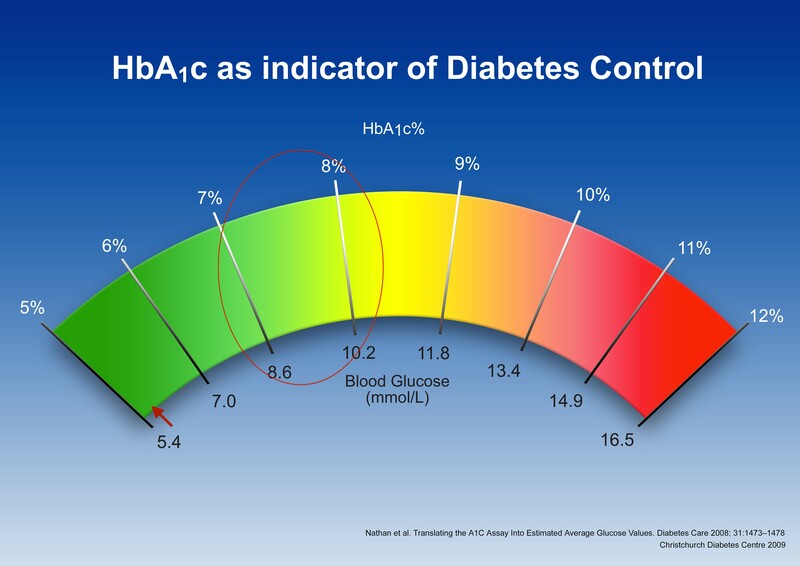 Target range for blood sugar level is between 4mmol/l and 7mmol/l. During training/race, it is risky to have the sugar levels too low and if they drop below 4 mmol/l, then that causes all sorts of problems. At around 3mmol/l, you get reduced effort, an inability to push yourself, lethargy, and as it gets lower, I run the risk of passing out. Equally difficult for people with type 1 diabetes is the risk of the sugar level going too high. It is commonly understood that exercise reduces blood sugar level, but only if your blood sugar is below approximately 13mmol/l. Any higher than that, then exercise triggers a response that will increase the blood sugar level further. High blood sugars are extremely uncomfortable (not to mention dangerous), and exercise is not really possible. So during a race, my target range moves from between 4 – 7mmol/l to between 6 – 9mmol/l. Sugar levels were excellent during the night. Trending between 4mmol/l and 6mmol/l. There is something called the Dawn Effect, which causes everyone’s blood sugars to rise just at dawn. My Dawn Effect kicked off at 4am, and took my sugar (not caused by eating anything) from 4 to 7mmol/l. Before the race, my sugar level had stabilised. I take a cup of super-salty soup stock (taken from The Art and Science of Low Carb Living), and two coconut fat bombs (basically coconut oil, coconut butter sweetened with stevia). The fat bombs are to get in some good fuel from the coconut (which contain saturated fats) just before exercise – this is something you need to play around with, as everyone has a different tolerance level to coconut oil. You can see at the start of the race my sugar level then starts to rise again. This is a strange phenomenon that I have noticed. I think it is caused by the tiny amount of carbs in the fat bombs and soup stock, as well as the body utilising the last of the glucose stores in the muscles. This increase in sugar never lasts long. You can see here that it increased from 6am to 6:20am. The sugar level was taken from a stable 7mmo/l up to 10mmol/l. Then it becomes a waiting game. I take zero carbs, and wait for my sugar levels to drop. I know they will. It usually takes over an hour. I check my Continuos Glucose Monitor all the time. Blood sugar stays stable at around 9-10mmol/l for 90 minutes. Then, over the course of the next 60 minutes, my sugar level slowly descends from around 9mmol/l to 5mmol/l. I don’t let it drop below 5mmol/l, and therefore I take my glucose supplements that I carry with me. I use Dextro Tabs, where each tab is approximately 3g of carb. I end up taking 10 tablets as I am feeling my sugar levels dropping further. So I take a total of 30g carb around the 2:30 hour mark. You can see over the next 20 mins that my blood sugar levels stabilise and then drop again. At this point, I am feeling very poor on the marathon. I am not thinking clearly, and just trying to survive. Instead of taking more Dextro Tabs, I elect to take some coke at the water stations. I take a small serving of coke (100ml) at each of the last 3 water stations. This is a total of 300ml of coke or a further 30g of carbs. You can see what this extra boost of carbs did for my sugar level in the last 30 mins of the race. Immediately after the race, my sugar levels stabilised at 9mmol/l. About half an hour after the race, my sugar level started to increase again. I think this is a result of taking coke too close to the end of the race, and not having enough exercise to burn it up. I should have stopped drinking coke about 30 mins before the end. I corrected this high blood sugar by taking insulin, and then I treated myself to a binge meal (and beer – I did just complete a marathon after all 🙂 ) and that caused the last spike in sugar around 12:30pm. So there you have it. 4 hours massive effort on 60g carb, and the 60g ended up being probably about 10g too much. Comparatively speaking, 1 Gu gel is 22g of carb. *Dietitian and colleague Caryn Zinn aptly changed the acronym. It works.